The University campus is situated about 10 kilometers North West from the city center on the main Grand Trunk Road leading towards Torkham (Pak-Afghan Boarder), the historical border town. It is located ideally on a picturesque site of over 1050 acres of land, 1199 ft. above sea level. The University is the “mother” University of the Khyber PakhtunKhwa, founded in Oct. 1950. It has expanded over the last fifty years and a number of buildings have been added. The total built up area of the campus is more than 1.5 million sq.ft. However, its original sprawling lawns and lush green tracts have been retained. The academic ambience of the University is enhanced and enriched with the presence of such national organizations in the vicinity as the Pakistan Council of Scientific and Industrial Research, North Regional Laboratories; Academy for Rural Development; the Pakistan Forest Research Institute and College; the University of Engineering and Technology; the Agricultural University; Institute of Nuclear Medicine; and Khyber Teaching Hospital. It is essentially a residential University with anapproximate population of about 35000. The University has a sprawling campus of 1050 acres. Grounds are levelled and turfed. Trees, bushes and hedges have been planted on an extensive scale in the residential bungalows and on either side of the roads. There is an effective and vigilant arrangement for security on the campus. Besides the regular University personnel, there is constant patrolling on the campus by the camps peace corps. 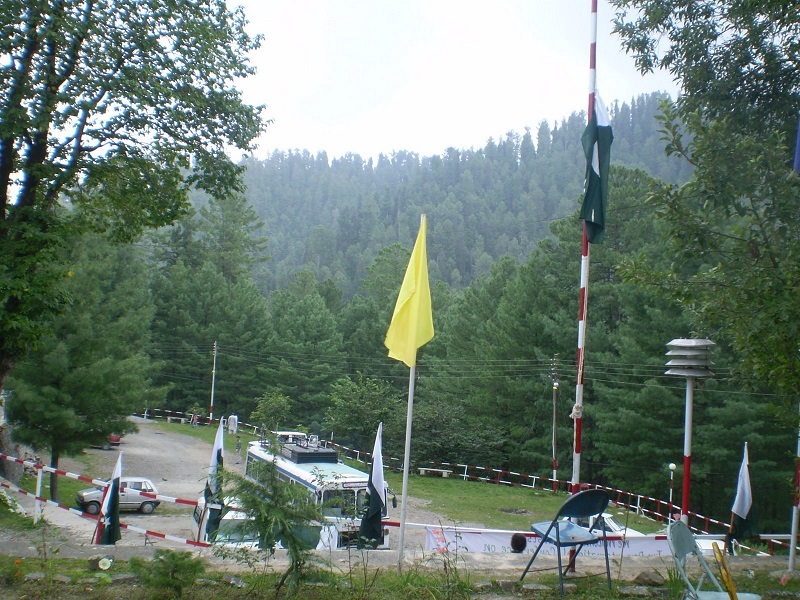 The Campus II of the University of Peshawar is located at Bara Gali on the Abbottabad Nathia Gali - Murree Road, at a distance of approximately 30 kilometers from Abbottabad, having an altitude of 8000 ft above the sea level, and is spread over an area of 60 acres of land. 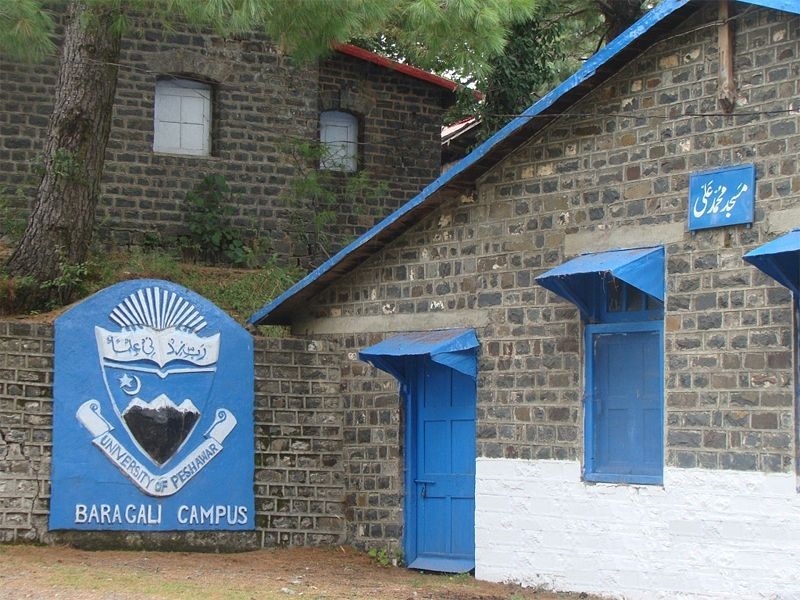 Bara Gali, one of the most beautiful valley resort with dense forests, tall mountains and very pleasant climate, is enjoying the status of Campus II of the University of Peshawar since 1965. It is the thrust of academic and research activities particularly during entire summer, i.e. May to September. Each summer, around 20-25 International and National Seminars, Conferences, Symposia, Workshops, Training courses, etc. are held at this Campus, which are attended by more than thousand delegates from home and abroad . Thousands of our students from the various teaching departments / schools / colleges / centres visit Bara Gali , for various academic and research activities and pleasure trip round the year. its academic activities boost up during the summer vacations.